The PYRO-ENERGEN machine was invented sometime in 1968 to eradicate the origin of virus and diseases of unknown cause. PYRO-ENERGEN is the first and the only one of its kind that uses static electricity for medical treatment in the world. Static electricity is the situation where electrical charges build up on the surface of a material. It is called "static" because there is no current flowing as in AC or DC electricity. Static electricity is usually caused when materials are rubbed together. The result is that objects may be attracted to each other or may even cause a spark to jump from one object to the other. Common examples of static electricity in action are static cling, flyaway hair and the sparks that can occur when you touch something. PYRO-ENERGEN machine can produce static-like electricity of about 18000 volts depending on the insulation between the patient and the ground. Climate or humidity influences the range of static voltage, too. Static-like voltage is stepped up from AC line house outlet voltage. Many ask us if the output voltage is AC or DC. Take note that output voltage is neither AC nor DC. It is static-like electricity voltage. The consumption of the machine is less than 5 watts. The machine does not consume high wattage. The machine uses an electronics technology that produces static-like electricity. 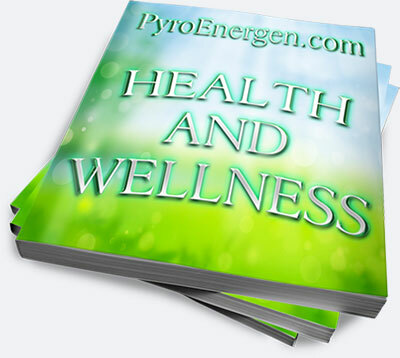 We call it the PYRO-ENERGEN technology that can treat various diseases of the world. We do not use any technologies existing within electro-technologies and medical technologies of today. Therefore, the world's health ministries including the America's FDA cannot or does not certify or approve the PYRO-ENERGEN. 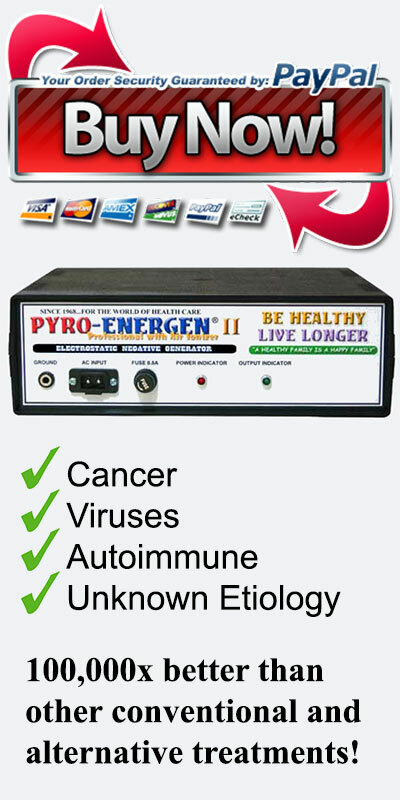 Although the machine is not approved, the fantastic thing about PYRO-ENERGEN is that it heals various incurable diseases of the world in a matter of days. Since 1968, through word-of-mouth, magazines and newspaper ads made the name of PYRO-ENERGEN to spread around the world. Thousands of units were patronized by thousands of sick people remarkably. When the internet became popular, we started marketing our machine online sometime in 1999, and the PYRO-ENERGEN boomed all over the world. Soon, several imitation or fake machines in various names surfaced in Japan. However, there were no units with static electricity technology. All of them were with AC stepped-up voltage maximum of 9,000 volts (under the regulation of the Ministry of Health), because it is too dangerous to use more than that voltage for human due to great amount of side effects caused by voltage penetrating the human body. Then, another imitated machines under different name surfaced in Taiwan, copied from other fake Japanese machines. In the Philippines and Canada, someone imitated our machine including statements in this website, but they were not able to produce any static electricity but AC stepped-up. Since their machines are imitations and people behind them have no knowledge of how the PYRO-ENERGEN technology can heal diseases, they never explained how the machines work in the body. They just had to state in their brochures that: It should not be used – by women who are pregnant and having menstruation; by patients with high blood pressure; by patients having fever; by individuals with heart disease; by patients with pacemakers or other metal objects embedded in the body; after a surgical operation; after taking a bath, etc. due to severe side effects. For men, their spermatozoa will be sterilized, meaning side effect as male menopause. If you are under any high-tension voltage, menopause and other strange symptoms will occur. No companies state about this big side effect! For this reason, does the FDA forbid applying more than 9000 volts? Users are not allowed to use it more than a certain minutes due to side effects. Body temperature of patients who use the machine will rise as one of side effects, thus they have to limit the time of usage carefully. Many prohibitions are stated in their websites, too. Later on, more side effects might appear. Now, why do they imitate the PYRO-ENERGEN machine? It is because our product is excellent and effective. PYRO-ENERGEN genuine machine is made and distributed through authorized PYRO-ENERGEN networks only. For verification, contact info@pyroenergen.com. Our genuine PYRO-ENERGEN has none of these side effects, thus you can use the machine without the above-mentioned precautions. Static electricity does not induce any current to your body. It is one of the safest electrostatic therapy machines in the world. Please be noted that if you find any other machines operating in similar way or saying that their machines are operating with word “Static”, then, they are all imitations of the PYRO-ENERGEN. Devices that have "9000" affixed in their brand names and other related machines produced in some Asian countries are completely fake. As of now, there are about 30 companies in the world including in some European countries where the words "static therapy" are surfacing, although they are not. Once again, they just operate with AC high voltage of about 9000 to 13000 volts. Only the PYRO-ENERGEN is operated with STATIC electricity in the world. And why do they make fakes or imitations, and trying to copy the PYRO-ENERGEN technology? Is it because the PYRO-ENERGEN works remarkably?